Papoose Flat is known for its unique landscape of randomly isolated granite spires that dot the flat, and for the marvelous views of the Sierra Nevada crest and Owens Valley below. 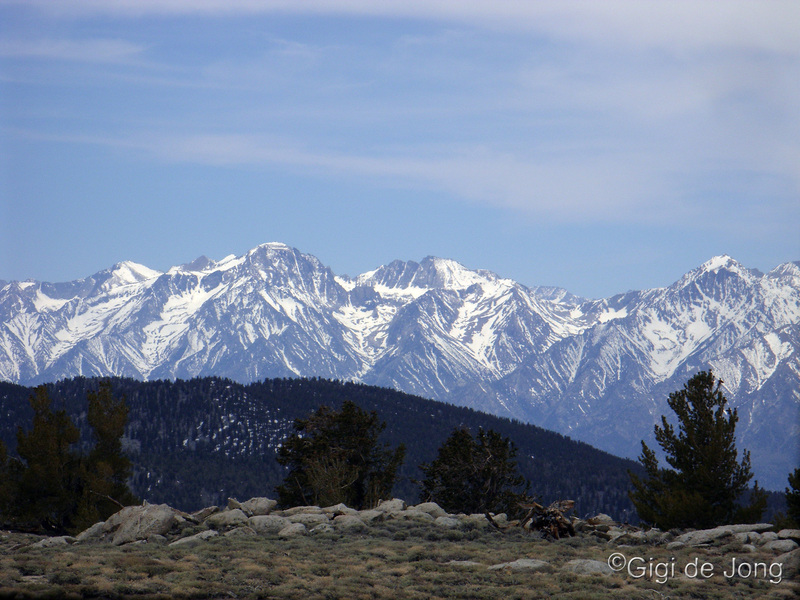 It is situated almost directly above Tinemaha Reservoir, at the crest of the Inyo Mountains, which separate Saline Valley from the Owens Valley. This high desert flat is a circular, tree-less expanse of scrub desert dominated by these tall granite spires rising out of the ground at irregular intervals. It has a sense of being ‘otherworldly’. Although it is a relatively well-known area it is not overly used. This is due to its remote setting and the rugged dirt roads and tracks that make it accessible only to well-equipped and experienced adventurers. It is perfect, if you have the wherewithal, for a remote mountain adventure that’s not too far from town. Primitive camping on the flat or among the trees at the edge of the crest overlooking the valley is serene and quiet. Depending on your mode of travel this could be a day adventure or a few days of camping and exploring. Night time up here is a stargazer’s dream. 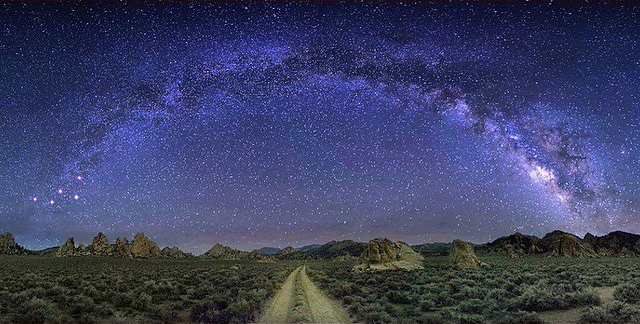 New moon nights will be exquisitely lit by a canopy of bright stars and the creamy Milky Way. Hikers, bikers, trail runners, OHV drivers and photographers will find a brave new world to explore and experience on Papoose Flat. Motorized access to the flat requires a high clearance vehicle, preferably 4-wheel drive, or an adventure dirt bike. Mountain biking and bike packing are great ways to get up to and around the area. And a hike in for an overnighter or a few days of camping is a great way to get away. It offers a wonderful loop of about 25-miles for experienced trail runners to get a good high altitude run with changing views and challenging landscapes. However you get there, make sure to take plenty of water up to Papoose Flat. There is no reliable water source up here. If you plan to stay more than a day, it is also advisable to be well prepared with extras of everything. Summer is a great time to experience the cooling of the higher altitude at Papoose Flat and escape the heat of the valley. Late spring and early fall are also wonderful seasons for high altitude adventuring. Make sure to check weather forecasts and be aware of clouds building early in the day. Fluffy cumulus clouds overhead in the morning are often a sure sign of late afternoon thunderstorms. Lightning and flash flooding are potential risk factors. Getting to Papoose Flat from Bishop, head south on US Highway 395 for 15 miles, and turn left, east onto CA168. In less than 2.5 miles turn right onto Death Valley Road. Follow this quiet, scenic mountain road for 11.3 miles until you see a sign on your right for Papoose Flat. Turn right onto the dirt road and, almost immediately, in 0.1-mile keep right at the fork. The road will take you along the washes, down some dips, and up and over rocks, as you climb the switchbacks to get to the flat. It will serve up some fun 4×4 challenges; from steep slopes to rocky scree to big steps and tight squeezes. There are a number of cleared areas for primitive camping nestled under the towering rock formations. 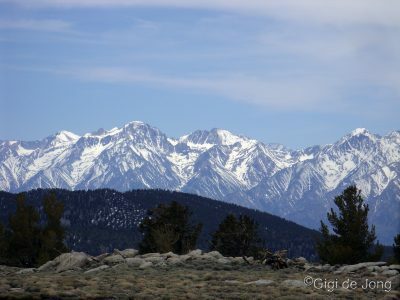 More are situated in the trees at the edge of the crest overlooking the Owens Valley as well as on the high ridges surrounding the flat. Please stay on track and only utilize spaces already cleared for camping. As always in the Eastern Sierra be prepared with layers of clothing – especially wind and waterproof layers as the weather can change rapidly. Take plenty of water, extra food, and, especially when going up to Papoose Flat, take a first-aid kit and vehicle spares. If you’re out on foot, wear a hat and sunscreen. Be sure to tell family or friends where you’re going and how long you expect to be away. Pack in as much (and perhaps a little more than you might need – in case of emergency) and please, please pack it all out again.